RACISM. [THEODORE ROOSEVELT]. Drawing. 1p, 5 x 6¼ in. [Followed by drawing of Alice Roosevelt marrying Booker T. Washington]. In 1901, Roosevelt invited Washington to dine with him at the White House, making him the first black man ever to do so. 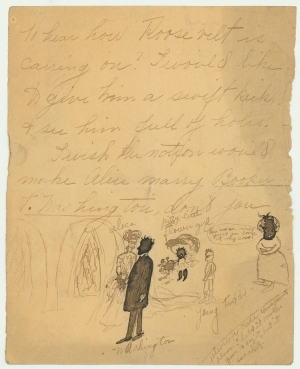 Whoever wrote this racist note and drawing apparently did not approve of the gesture, suggesting that Roosevelt’s eldest daughter Alice marry the Civil Rights pioneer.